There are ten essential laws of financial success. A money law is not a money opinion. These money laws are proven principles describing the way money works in the real world. These money laws are proven principles describing the way money works in the real world. They are explained in detail in their corresponding articles, but on this page I want to simply list and define them for you. Each title is a link if you want to check any of them out now. 1. THE LAW OF EXPECTATION. All individuals have a potential for prosperity and financial freedom when they expect and plan for them. 2. THE LAW OF COMMITMENT. Money is a trust that we must choose to manage wisely, productively, and honorably for our own good, for our families, and for others. 3. THE LAW OF CONTROL. While each of us has a potential to live prosperously in constructive control of our financial affairs, this potential becomes a reality only when we live in harmony with proven principles of financial success. 4. THE LAW OF MANAGEMENT. 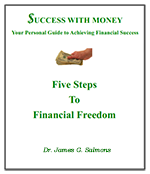 Asserting control over our financial lives requires us to manage our personal finances as we would those of any important business, utilizing basic management skills such as goal setting, planning, organizing, record keeping, allocating resources, evaluating, and decision making. 5. THE LAW OF FINANCIAL FREEDOM. Financial independence is not generated by temporary levels of wealth or income but by setting correct priorities, exercising self-discipline in financial decisions, living debt free, effectively managing resources, and claiming it as a personal emotional and mental attitude. 6. THE LAW OF PRODUCTIVITY. Each of us prospers in proportion to our productivity as we increase our moneymaking skills and direct them toward long-term personal benefits. 7. THE LAW OF SELF DISCIPLINE. Prosperous people do honest work for their money, expect fair compensation for their work, and understand how money works in the real world. 8. THE LAW OF ENTHUSIASM. Becoming a productive, effective, and prosperous person can and should be a lot of fun. 9. THE LAW OF PATIENT PERSISTENCE. Success with money requires persistence and patience as much as it does knowledge and skill. 10. THE LAW OF TRUE WEALTH. Real prosperity is measured as much by how we use our money as it is by how much we have. This section on our navigation menu, Money Laws , contains links to articles explaining each of these laws. These are concepts a person needs to understand for complete success with money. In addition, Every month I write about some aspect of one of these laws in my Success With Money Action Newsletter. Included are suggested practical applications that will help you apply these principles to your life. Enroll today to receive your free subscription. Begin to experience a new relationship to your money.